Cape, tights – this is a superhero in action. 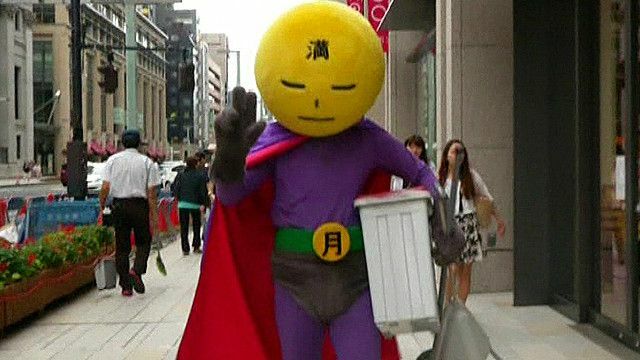 Meet Mr Full Moon, always ready to keep the streets of Tokyo clean. His weapons are the broom and the dustpan. The lonely dirt fighter is becoming a celebrity in the area. Like many superheroes, Mr Full Moon keeps his true identity a secret and lets his smartphone do the talking. He wants others to follow his example. This area is clean now. Mission accomplished. Time to sweep off.